Dogs and humans are both omnivores, and our diets are broadly similar, but there are a few important differences. It’s actually very easy to feed a puppy or a dog correctly, but it’s also easy to make big mistakes. 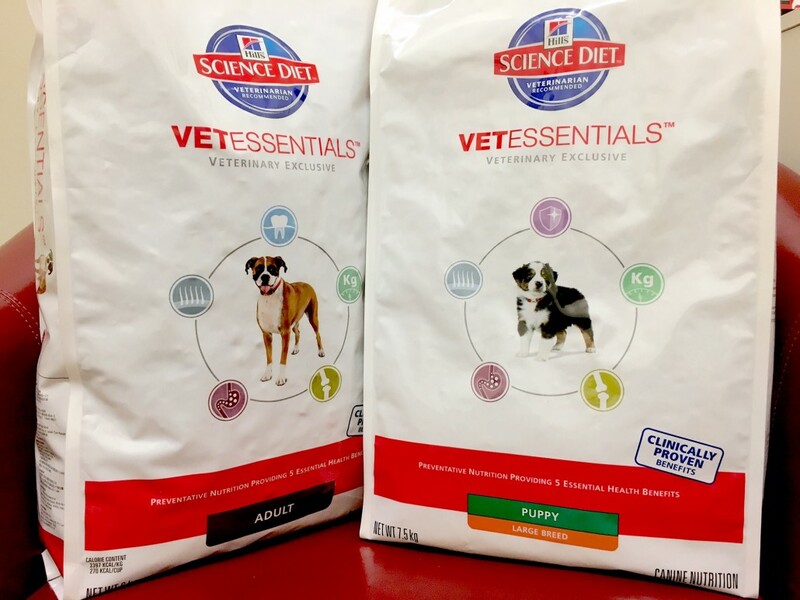 A complete, balanced puppy or adult dog food gives the peace of mind of knowing all the major nutrients are included. A good manufacturer will follow the latest science and understanding of the requirements of dogs, and engage in research, development and testing. You are paying for their expertise. We recommend either Hills or Royal Canin as companies you can put your trust in. These high-quality diets require no extra supplements; in fact, adding supplements (especially calcium) can unbalance the diet and be dangerous. Are you struggling to get your puppy onto one of these diets? Read our guide to getting puppies to eat dry kibble. 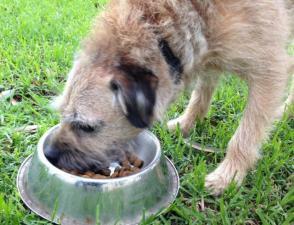 It is possible to make a dog’s diet entirely at home, but we don’t recommend this quite yet. If you’re interested, read our guide to making safer raw diets for dogs. Add a tablespoon per day of fresh fruit or vegetable. This can be any item, and in fact it’s good to vary and experiment with your dog’s tastes. Most people will keep aside a small portion of the veges being chopped for dinner or a slice of their fruit but remember that grapes, onion and garlic are toxic. No starchy vegetables please. Grated carrot is an easy option if nothing else is available. Similarly, dogs often enjoy nibbling on fresh grass. Why do we do this? 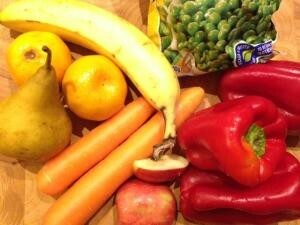 Rates of cancer may be less in dogs supplemented with fruit or vegetables and it helps dogs not to get fussy. Also, dogs love these, and regard them as treats. Just don’t tell them they’re good for them! Some form of dental hygiene is essential. We recommend dog be fed raw bones as a regular part of their diet. However, to safely feed dogs bones, you will need specific advice based on a vet’s assessment of your dog’s breed and feeding behaviour. Therefore, do not feed raw bones until you have consulted a veterinarian on this subject. 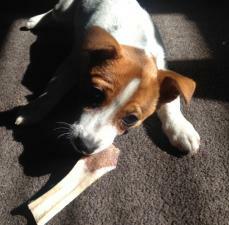 Read more at our pages on How to feed bones to dogs and Where to buy bones for dogs. Other dental hygiene options include Dentastix and Greenies. While probably not as effective as bones, and needing to be fed daily, you can start without first seeing a vet. There are also a range of good dental diets for adult dogs from Hills and Royal Canin. Provide fresh drinking water at all times. You can offer ‘puppy milk’ but never cow’s milk as all dogs are lactose intolerant. Most puppies don’t need milk after 8 weeks of age but it can be useful to help them settle in. Treats don’t have to be bad for your dog, and their tastes are very different from ours. Read our guide to safe and healthy treats for dogs. Meat off the bone is high in phosphates and lacking in calcium. This will tend to have a depleting effect on the body’s stores of calcium in the bones and may cause major growth problems in puppies. Extra meat is probably unhealthy. It can cause some dogs to be more prone to gastrointestinal upsets such as acute vomiting or diarrhoea, and there are hints of a reduced in lifespan in dogs on higher meat diets. Dogs are omnivores, not specialised carnivores like cats. Meat is undoubtedly popular to dogs, and they will tend to start refusing their balanced diet if being fed meat. A second common mistake is to feed table scraps or leftovers. Once again, these items will create a fussy dog prone to gastrointestinal upsets. Think carefully before doing this as you’ll also have a dog begging for food from family and guests every time they eat. There are also some specific foods which humans eat which are toxic to dogs. 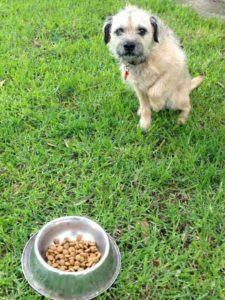 See the list at Dangerous foods for pets and our data on dog poisonings in Adelaide. 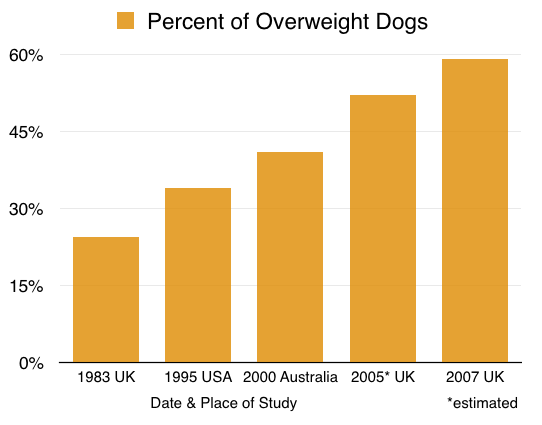 Have a look at the trend from five recent studies on canine obesity and you’ll see the problem in our society. Your dog doesn’t have to be a statistic like this: our guides to the dangers of overweight dogs and how to keep dogs at their ideal weight are full of advice and tips to keep your best friends at their perfect shape. Puppies from 8 to 12 weeks should be fed three times a day. From 12 weeks to 6 months they need twice daily feeding. After this time most dogs move to once daily feeding as they do not need or expect to be fed more than once a day. People often react in horror to this suggestion but trust us: after a few days they will forget the second meal and be just as happy. No vet, no dog food packet and no website can tell you the right amount for your dog; you have to work it out yourself. Luckily it’s not that hard if you can be logical and unemotional. Don’t let advertisers tell you that your dog needs a varied diet. This is only true if you train them that way. A dog is just as happy fed the same food every day as long as you keep their expectations in line with this. However, there is no great problem with variety (other than inconvenience) as long as all the foods are equally good and your dog eats well. There’s no need to feed a dog in a bowl. You can select from a wide variety of creative ways to feed a dog which simultaneously keep them interested or entertained. Let’s face it; in the wild their moose isn’t served in a bowl. There are puzzles, mazes, balls, Bob-a-lots or Kongs to stuff with either their regular meals or specially bought or prepared foods. You can even deliberately hide or bury things as long as you think about the safety and spoilage issues first. Here’s one of our nurses’ recipes for stuffing Kongs or similar hollow toys. You’ll find other food dispensers on our dog toys page. There are plenty of good ways to fill Kongs. We’re not too keen on dogs having a lot of peanut butter so this is one of our favourites. Seal one end of the Kong with a small amount of low fat cream cheese and fill with mixture. Add a few dog kibble and a few almonds or cashews. Fill up to the top with low salt liquid beef stock, sit upright in a container and seal the end with more cream cheese.